A fantastic Christmas gift from the Missus, Loonshine Liquor is the first offering (launched in 2014-- though- they've done more since then) from Loon Liquor of Northfield, Minnesota. Just looking at the bottle, they already kind of had me: locally sourced organic ingredients? In a whiskey? Sure. I'm all in. Gimme. But when you go their website and read their story- it gets even better. These two guys launched a microfunding campaign that raised $11,500 which enabled them to get an SBA Loan and then in November 2013 they became the first two people in Southern Minnesota to get Federal permission to produce spirits in over 100 years. Color: Pale and almost clear, there's just a hint of the palest shade of yellow when you hold it up to the light. Honestly, this is probably the lightest colored whiskey that I've ever tasted that's not straight up moonshine. 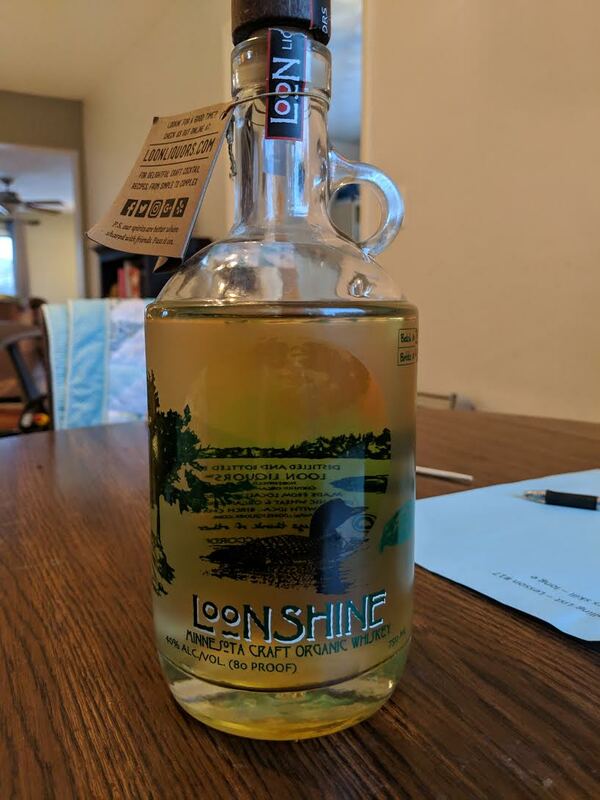 The color gives you pause a little bit just for the moonshine factor... you're honestly kind of bracing yourself for a real nice kick in the face, as Moonshine is often inclined to do- but with Loonshine, you get a pleasant surprise instead. Nose: The nose on this is hard to figure out-- if I had a guess, I might point to the barley used in the grain bill because there's a savory, almost grainy smell to it but the more you smell it, there's an underlying sweetness to it as well. It's not harsh at all-- the alcohol content doesn't singe my nose hairs or anything, but it's intriguing. After a lot of sniffing, I settled on 'spicy grain' or maybe rye bread of some kind. The nose on this is one of the most complex and unique I've ever encountered. Body: Oh man, this is nice. It's well balanced on viscosity but it just melts in your mouth. Buttery smooth mouthfeel and there's a little bit of spiciness there, but it's not at all harsh. No burn here, just seriously gorgeous delicious stuff. Finish: Oh this is nice... so nice. So smooth. It warms gradually and just goes down a treat. It's like buttah! But whiskey, which makes it better.